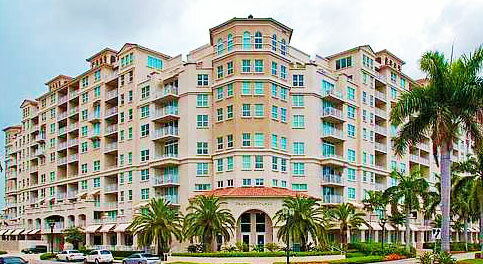 Palmetto Place is a nine-story resort-style condominium community situated in the heart of Downtown Boca Raton. Known as one of the finest luxury residential condo buildings in Boca Raton, Palmetto Place is nestled on Mizner Boulevard, just a short stroll from the famous Mizner Park & Amphitheater and the beautiful Boca beaches. Palmetto Place boasts breathtaking views of the rolling fairways of the nearby golf course and the sparkling blue waters of the Atlantic Ocean. Palmetto Place offers 255 private residences for sale or for rent, ranging from one- to three-bedroom townhome-style units to two-story duplex penthouses. With such a variety of housing options from which to choose, there is sure to be something to suit every type of home buyer at Palmetto Place. Residences at Palmetto Place in downtown Boca Raton boast an extensive list of highly desirable upscale features and finishes. All units are pre-wired for telephone, satellite television, and high-speed internet access. They also feature privately controlled, high-efficiency central air conditioning and heating systems, hurricane-resistant glass windows and sliding doors, and in-unit washers and dryers. Palmetto Place condos feature gourmet kitchens with luxurious European-style cabinetry, sleek marble flooring, granite countertops & backsplashes, stainless steel under-mount sinks, and GE Profile appliances with custom cabinet door paneling. Master bedrooms at Palmetto Place feature spacious, custom walk-in closets and luxurious master bathrooms. Bathrooms feature lavish marble vanities, upscale satin nickel fixtures, and saturnia marble tub surrounds. Renting is also made convenient in Palmetto Place with flexible lease options to choose from depending on the length of your stay. Palmetto Place is perfectly located in downtown Boca Raton, just a short distance from Boca's beautiful beaches, Royal Palm Place, Mizner Park, Boca Town Center, and some of the best dining, shopping, and entertainment venues in the area. I-95 is located just 2 miles West of Palmetto Place, providing residents with easy access to South Florida's bordering cities of Ft. Lauderdale and West Palm Beach. Living in Palmetto Place is comparable to living in a five-star downtown resort that is placed in the middle of a tropical paradise. If Palmetto Place sounds like the perfect place for your own private South Florida retreat, you may also want to visit 200 East, Tower 155, and Boca Grand, which also offer luxurious condominium living in the heart of downtown Boca Raton. If you would like to learn more about Palmetto Place or any of the surrounding downtown condos in Boca Raton, please call us at 561-235-7800. You may also reach us by completing our simple online contact form provided below and one of our expert luxury real estate specialists will reach out to assist you. We at Champagne & Parisi Real Estate look forward to assisting you in finding your next dream condo in beautiful Boca Raton, FL!